Posted on Wed, Feb 22, 2012 : 5:59 a.m.
Six weeks after announcing Cafe Habana would relocate to make room for the adjoining Blue Tractor to expand, renovations at the restaurant are complete and Blue Tractor has introduced its new menu. The barbeque restaurant and brewery located on East Washington Street in downtown Ann Arbor has doubled in size and now has a seating capacity of 211 people. 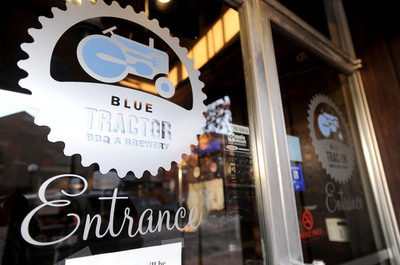 The reason for the expansion: Blue Tractor sales were up 19 percent in 2011 and the restaurant “just (didn’t) have enough seats”, said owner Jon Carlson, who opened the restaurant with business partner Greg Lobdell, operating partner Dan Glazer and other investors in 2008. As part of the expansion, they temporarily closed Cafe Habana and plan to reopen the restaurant in the Parthenon Restaurant space on South Main Street this summer. Parthenon is still open and plans to close in the coming months. After renovating the former Cafe Habana space to look like Blue Tractor, the entire restaurant is now open. 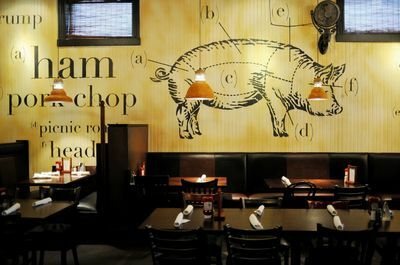 The former Cafe Habana wall is painted with a pig graphic. Changes at Blue Tractor include a new hot deli case for prepared foods, a retail counter, and an expanded waiting area. The former Cafe Habana has been decked out in reclaimed barn wood from the Midwest, a giant pig graphic is painted on the wall, new TVs are mounted and the bar has been replaced with additional seating. The pathway that connects the two spaces now looks directly into an open kitchen, which allows people to “see inside and smell food from the smokers,” Glazer said. The Cafe Habana Cellar Lounge - complete with its popular salsa nights - is still located in the basement of the restaurant, and it now has its own entrance from East Washington Street. Eventually, the lounge will transition into a new concept that is yet to be revealed. “What I can say is we’re going to have a great atmosphere down there, and the new Habana (on Main Street) will inherit what we have going down there now,” Glazer said. Along with renovations to the space, the entire Blue Tractor menu has been revamped. Wilhelm said they kept Blue Tractor’s “classics,” such as fried pickle chips, corn muffins, sliders and the pulled pork sandwich, but threw in “eclectic barbeque” here and there. The new menu has inspiration for all over the world, he said. Some new items: Chile ginger spare ribs, barbeque wings with toasted sesame seeds, crushed tomato soup, salad with cured and smoked salmon and a smoked tofu hoagie. The restaurant now has a revised cocktail list and some new beer in the works, such as a partnership with Cherry Republic to make a cherry stout. Although it was a lot of work to prepare for and execute the expansion and menu changes, Wilhelm and Glazer agreed: it’s been a successful transition. “I’ve worked 120 hours a week and haven’t had a full day off, but I’m grateful for our staff and it’s really nice to see our hard work paying off,” Wilhelm said. Mon, Feb 27, 2012 : 4:29 a.m.
Thu, Feb 23, 2012 : 3:39 a.m.
Thu, Feb 23, 2012 : 1:18 a.m.
A moment of silence for the dear, departed buffalo chicken mac and cheese, please. Fri, Feb 24, 2012 : 6:05 p.m.
uhhh...not sure what you are looking at Tom. I frequent the place and can tell you that you are incorrect! They have different styles of glassware now for different styles of beer. Maybe you were looking at a half pint? You should probably be sure about these things before you go onto a forum and complain....oh wait, i forgot what forum we are on! Wed, Feb 22, 2012 : 6:52 p.m.
Jon, While we're excited to see your additions to the menu, please consider bringing back some of our favorite Blue Tractor dishes that you've taken off: - Pulled Pork Quesadilla - Blackened Catfish - Beer Battered Onion Rings Why!? You guys did these so well! Wed, Feb 22, 2012 : 4:27 p.m. I'm a vegetarian but love the wonderful Harvest Salad and Mac &amp; Cheese at Blue Tractor. I hope they'll still have a non-smoked version of the Mac &amp; Cheese available. Wed, Feb 22, 2012 : 4:01 p.m. Wed, Feb 22, 2012 : 3:47 p.m. The new menu AND the bar selections are more pricey. Blogger EpicA2 reports that dinner and a drink averages 42% more than the menu the owners decided to jettison. The Tractor is good, but not that good. I am taking my hunger elsewhere. Thu, Feb 23, 2012 : 2:15 a.m. Wed, Feb 22, 2012 : 3:43 p.m. I log on and this is the top headline? Wed, Feb 22, 2012 : 3:37 p.m. I hope they replicated the burnt ends from Lockhart's in Royal Oak, those things are scrumptious. Wed, Feb 22, 2012 : 2:49 p.m.
Oh No. It can't be. They've.....they've...... they've ditched the braised greens and replaced it with Brussels sprouts! NOOOOOOOOOOOOO!!!!!!!!! Wed, Feb 22, 2012 : 7:16 p.m. Wed, Feb 22, 2012 : 5:28 p.m. I personally am glad to hear they changed the menu, as I really only like two entrees they offered. It needed to be freshened up, so we haven't visited for a while. But I loved loved loved the collard greens. Now that made it worth going. So I am going to have to think really hard about going to try out the new menu not that I know I can't get my greens. Wed, Feb 22, 2012 : 4:58 p.m.
Oh, let me clarify. My horror is not over Brussels sprouts. I like them. (Although I think people who do are a pretty small minority, and frankly I can't believe Blue Tractor couldn't come up with a better/more popular choice.) My angst is over the fact that they've removed one of my favorite items. Collard greens cooked as Blue Tractor cooked them are not found easily around these parts. Satchell's has 'em and they're pretty darn good. At least Blue Tractor kept the cheese grits. Wed, Feb 22, 2012 : 4:05 p.m.
Grange has the best Brussels ever! Wed, Feb 22, 2012 : 4:03 p.m.
Brussel sprouts are better at restaurants, and they don't stink up your kitchen. Morton's serves brussel sprouts, they are yummo if done right. Wed, Feb 22, 2012 : 3:01 p.m.
Brussel Sprouts?!? I heard those are getting huge in Brooklyn and Portland. Wed, Feb 22, 2012 : 2:39 p.m.
OK- am I afraid to post on this ?? ?- yeppers but just want to clarify. I won't comment on design because everyone has different taste but we love it and as owners, we came up with it. One of our partners has undergrad degree in Art and a Masters is Architecture from UM so we handle all our own design- love it or hate it-it is all us. We did not jack up pricing and strive to be a casual restaurant that is priced right in the middle. We did look at other BBQ places in the area and we are not the lowest and not the highest. FYI We are fans of the others in town and Slows in Detroit is amazing. We aren't trying to be compared with these restaurants but know this will happen. We evolved the menu after we took trips to other areas of the country and learned so much. In Michigan, bbq places have we have not presented the full spectrum of BBQ that happens around the world. So many different cultures, spices, flavors etc.The menu will continue to evolve as we will have some hits and misses. We are local. We live here. Our kids go to Ann Arbor public schools and we love this City. OK- so I'm probable gonna get some comments back ripping on me but that is OK. I opened myself up to it. Thanks so much for your support and we will continue to strive to satisfy our customers. Wed, Feb 22, 2012 : 7:56 p.m. Sorry Jon but $14.95 for a half slab of baby back ribs? THAT is out of line. Wed, Feb 22, 2012 : 5:36 p.m. So, the prIces are NOT higher for the same/similar items on the new menu? Wed, Feb 22, 2012 : 5:03 p.m. Kudos to you for coming on here and exposing yourself. For my money, BT's beer is waaaay better than that Hops &amp; Water they call beer over at ABC. Pleeeeeease consider bringing back those delicious braised collard greens to the menu. I'm despondent that they are gone from the new menu. Wed, Feb 22, 2012 : 4:49 p.m. I hope you went back to the original mac and cheese. The first time I ordered it, it was very good, same as whats served at GP. Then I ordered it a few months later and I got a bowl of noodles with what seemed to be cheese whiz on top...not even edible. Please go back to the original. Wed, Feb 22, 2012 : 4:31 p.m.
Jon- Good job taking risks and bringing in other influences. The restaurant business is tough and you can't please everybody, but it is nice to see you have courage of your convictions. I enjoyed the old space and will try out the new menu. So you guys have house brews that you do? That cherry stout sounds pretty good. Wed, Feb 22, 2012 : 2:58 p.m.
Oh- and I am so scared about posting that I am reposting. OK- I know there are a lot of typos in my last post. ooops- Sorry. The Blue Tractor is pretty good--in a town filled with overrated burger chain places, it really stands out (next to the the well done thingy at Five Guys pales completely) and they did a nice job expanding, with one exception: the new room you enter into looks absolutely terrible when it is not filled with people. The lit up take-out fridge seems like a bad dream. I am sorry to hear about them mucking about with the menu and raising prices--their reasonable fare was one of their attractions. I smell the evil odor of a consultant at work--always the harbinger of a disaster in any part of life. Remember the days when we never heard of this pernicious occupation? Wed, Feb 22, 2012 : 1:30 p.m. I love the pig! Here piggy, piggy, piggy! Wed, Feb 22, 2012 : 1:25 p.m.
We're actually going there tonight and tomorrow! I'm excited to see the expansion and the new menu! Wed, Feb 22, 2012 : 5:22 p.m. Wed, Feb 22, 2012 : 5:21 p.m.
Yeah, I'm a little disappointed with that. The article says they have a new &quot;expanded&quot; menu, so I compared the old and new menu and only saw a couple new appetizers and one or two new entrees, and some of my favs from the old menu (Beer Can Chicken), have had their prices said (an extra $2 in this case). Wed, Feb 22, 2012 : 1:17 p.m. Wed, Feb 22, 2012 : 1:11 p.m. Hmmm....I'm not sure I can take my friends from the middle east here.....what with the pig. Wed, Feb 22, 2012 : 1:23 p.m. The menu is heavy on pork, regardless of the pig picture on the wall. It's BBQ after all . . . . Wed, Feb 22, 2012 : 1:08 p.m. I'm excited for Blue Tractor. Can't wait to get to Ann Arbor and check it out. I like the &quot;old&quot; menu. Wonder what the &quot;new&quot; menu will be like. I agree with MrBeasley about the pig picture -- really? I might not be a country or hillbilly boy but I do not need to see that hanging over my head. But then I can ask the host to be reseated. GOOD LUCK Blue Tractor, I will be there. Wed, Feb 22, 2012 : 12:51 p.m.
We really like Blue Tractor, and I 'm excited about the expansion, but that pig painting on the wall has got to go. I know in my mind what I'm having when I order BBQ, but I don't want to stare at a picture of the animal while I eat it. Wed, Feb 22, 2012 : 4:10 p.m.
Have you ever been to a pig roast? That is a lot more in your face then the picture presented here with this article. Wed, Feb 22, 2012 : 1:54 p.m.
That's alright. The pig isn't happy about the outcome either. _To Serve Pig_ .... see reference to The Twilight Zone series. Wed, Feb 22, 2012 : 12:43 p.m.
You mentioned a change to the menu. I'm good with the menu they have.